When the Verizon Chairman and CEO Lowell McAdam said recently on the “CEO Sit-Down” with Bloomberg "this is the era of big data," he was talking about the benefits of new Verizon 4G cellular broadband networks. Today, this fourth generation of cellular wireless standard can achieve download speeds upwards of 10 Mbps, with even higher speeds expected for the future. The 4G network connection capability of the VGo telepresence robot was developed with support from the Verizon LTE Innovation Center and is featured in Verizon’s first combined annual and corporate responsibility report. The application featured is helping a homebound student stay involved with his teachers and peers while recovering from medical treatments. Telehealth solutions, promise to have a profound impact on patient care, its quality and safety, and can also help drive costs out of the healthcare system. For instance, enabling the chronically ill and elderly to receive care from home reduces the number of hospital admissions and readmissions, which are riddled with expense and risk of exposure to other illnesses. 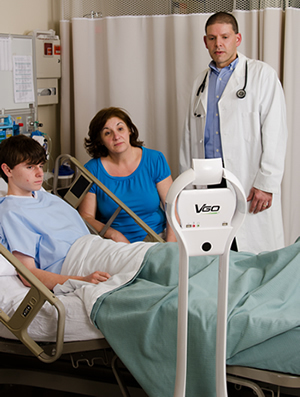 VGo is a leader in moving beyond the hype cycle of telepresence robots in healthcare and into practical applications that are used in the hospital, elder and rehabilitative care, and home environments using both Verizon’s 4G Network and in-house WiFi. Our partners at Children's Hospital Boston recently told us a story about one family participating in their study of post-operative care using VGo. The doctor, via VGo, and mother were at the child's bedside discussing his care. It was early evening and her other children were clambering for their dinner. The mother said she really couldn't continue to sit and talk, to which the physician replied, "No problem, I'll come to the kitchen with you." He rolled down the hall, and the two continued their conversation while she cooked dinner for the rest of the family. Healthcare and communication industry leaders and visionaries are uncovering imaginative and innovative ways for VGo to truly impact the quality of people’s lives and the affordability of those improvements. It is exciting for us to have Dr. Hiep Nguyen, via VGo, as a speaker at TedMed in Washington, DC this week. His topic, "What if R2D2 Was Your Doctor?" - Yes, what if, indeed!